Let’s be frank with each other (because being suzanne with each other is much more difficult). I love strawberries and there is NOTHING better than a fresh one, all ripe and soft and still kind of warm from the sun…well, except for one thing. 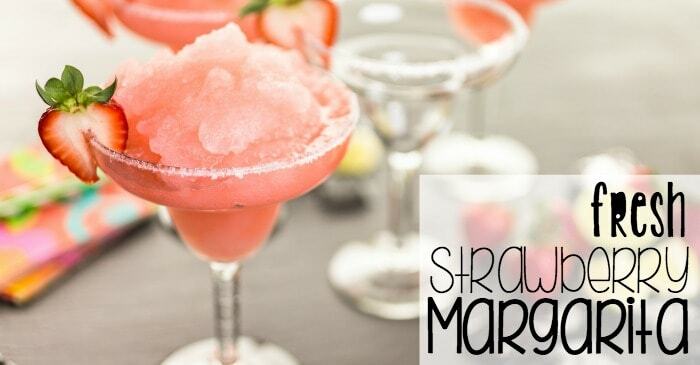 And that one thing is (bet you can’t guess)…Fresh Strawberry Margarita. Now, I know what you might be thinking: Chantal, this is like the 9millionth time that you’ve said you’re in love with strawberries–how far are you going to take this ridiculous strawberry-troupe?! Guess what, my friends? I’ll be taking this ridiculous strawberry-troupe all the way to the grave if I can, because that is a piece of honesty there–I. Love. Strawberries. My very first Fresh Strawberry Margarita wasn’t really a margarita at all. My mom made it for me at a little dinner party we were having (ok, so it was a backyard BBQ, but I can call it dinner party if I want) when I was about 10 years old. Of course she couldn’t give me one of the margaritas they were having–they were jam-packed with tequila. So she made a little batch of virgin ‘ritas just for me. Because my mom is awesome. But, after I turned 21 and was able to make the decision to drink responsibly (because, kids, that’s what you do–you wait like a patient person and then you decide and the RIGHT decision is to drink responsibly, if you’re going to drink at all. End of story. ), I tried over and over again to re-create that first margarita my mom made for me…but I just couldn’t hack it. Not only were they all red (instead of the pretty pink she’d made for me), but they were also sugary-sweet and syrupy instead of strawberry-fresh and bright. And that was the kicker right there. 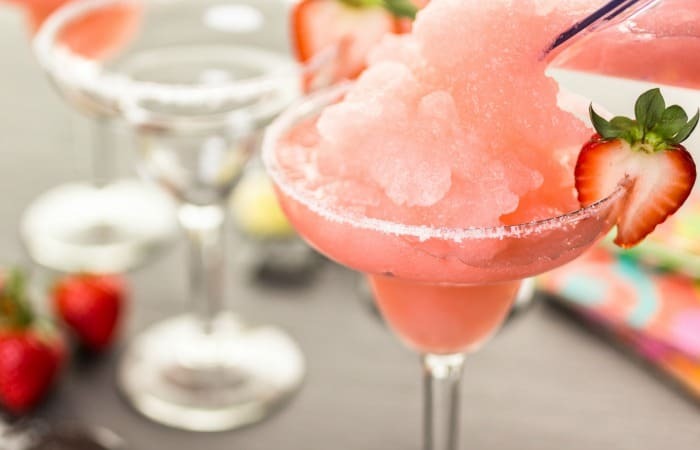 My mom reminded me that she NEVER used store-bought syrups for margaritas when I was a kid…they didn’t even make them like they do now…So, she’d always bought strawberries and used them to make our little margaritas, both virgin and not-so-virgin. 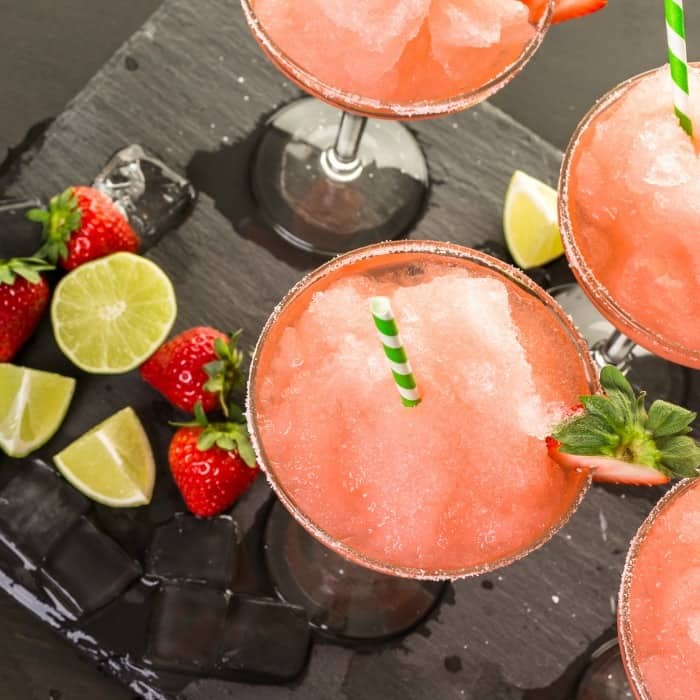 Well…this fresh strawberry margarita recipe is the result of making that one change (ok, there might be a couple of small changes–but using fresh strawberries was the ultimate key). And it tastes just like that magical first one. Now if only I could get my mom to tell me how to make lasagna as good as hers always was, I’ll be cookin’! There is NOTHING better than a fresh one, all ripe and soft and still kind of warm from the sun...well, except for one thing. 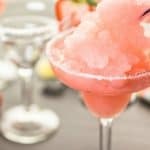 And that one thing is (bet you can't guess)...Fresh Strawberry Margarita. Cut the tops off the strawberries (except for one or two for garnish) and chop in large chunks. Sprinkle sugar over the strawberries and allow to sit for 5-10 minutes to allow the sugar to blend with the strawberry juice. Toss everything in the blender together until it's all smooth and perfect.